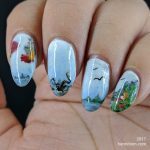 Welcome to Part 2 of my very long and belated look back on 2017’s nail art. 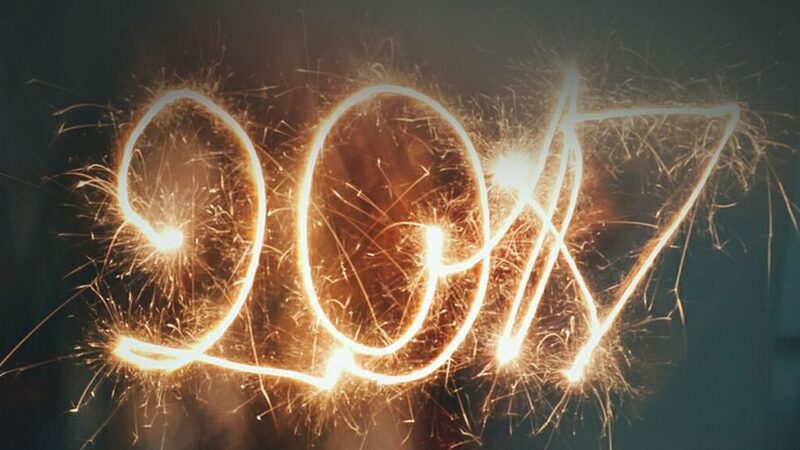 We still have five more months of favorites (and least favorites) before I start talking about what colors, nail polishes, and stamping plates I used the most in 2017 so let’s jump in! I also purchased a macro lens for my phone, so macro shots popped up every now and then on the blog. 2 Cwl 4 Skwl Still loving this one so much. The soft gradient that ties everything together. The reference to reading and sci-fi/fantasy. 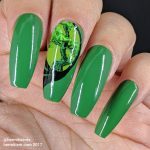 Now I’d have to add speculative fiction, superheros, and paranormal to the mix, but back when I was reading in class instead of paying attention, this mani says it all. 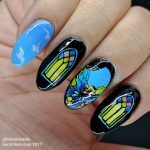 Shuttering of Stygian Skies This is my favorite freehand to date and I keep meaning to do a set for my left hand so I can pretend someday that I’ll wear them out to something. 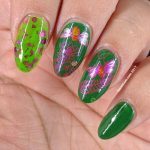 That would really only work if I gave up and cut my nails really short because it looks funny to have nail showing under your falsies. Still. 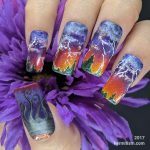 I want my full set of the Apocalypse! 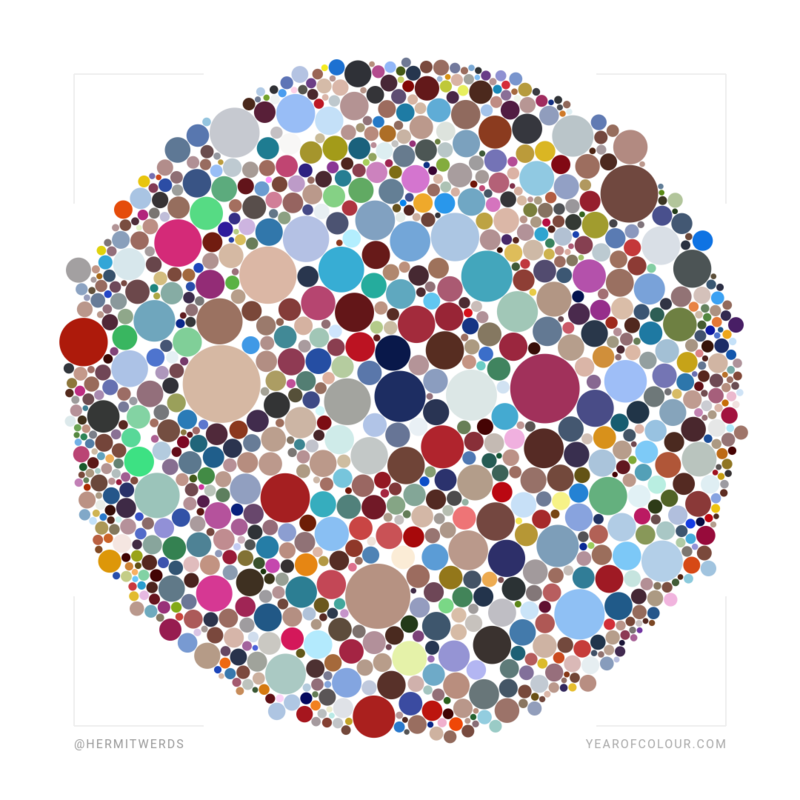 Busy Bees vs Busy Bees 2.0 As I mentioned in July I failed to follow the correct formula for this one. I just can’t stamp with KleanColor metallics when fine details are on the line. It never works out well. After one crazy month, you’d think I’d be tired. Instead, I was weirdly pumped and thought I’d give the #31DayChallenge another go even though I’d said I wouldn’t do it again in 2016. I was right. The prompts are a bad fit. 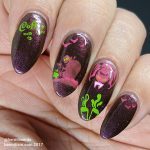 I painted a lot of nail art that just didn’t fit my style, but I did try a lot of new things. I noticed more people were posting multiple photos you could swipe through so I started making collages of closeups of each finger and letting people swipe to see the full closeup. It was a lot of extra effort in photo-taking and editing so I quit doing it before the month ended. Collages in general do less well on my feed. I also purchased a magnifying headset to help me fill in decals. Great tool for a nail artist. I have a big head, though, so it squeezes my melon and gives me a headache if I wear it too long. I need to use my husband’s heat gun and see if I can’t bend the headpiece back a little. Make way for my temples! Dragon Quilt This was my second time piecing together a mani from swatches of polish and decals. 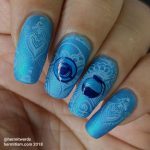 It’s basically nail art collage-ing and I don’t think I’ve seen anyone do it to the level I have because I include water marbles decals, and stamping on my swatches. Anyway, I love this and would like to do a whole series of all the Chinese zodiac, but it’s a lot of work so it keeps getting pushed back as a someday thing. Also, I’m so mad at myself for orientating it the wrong way. I’ve learned to be more wary of that mistake when painting false nails. Church of the Transient Butterfly I love stained glass. If I could add yet another hobby to my list, stained glass is right up there with making elaborate puppets. I would love to own a home with stained glass windows except my cat and I like to look outside and it’s a bit harder with them in. Ah, well. I settled for lead lighting my nails and that’s always a great technique. Creatures of the Night This was the perfect blend of a neat but very open subject-wise prompt and my desire to paint a coffee mani. Creatures of the Night totally equals vampire, right? 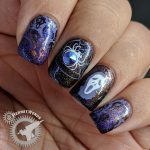 I could be a little frustrated that my stamping didn’t come out perfectly opaque, but I think it actually worked out this time by blending the images into the background a little bit. 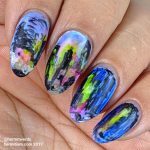 The Turning Leaves Rainbow is my favorite color and multichrome flakies are so, so pretty and rainbow-y. I will probably be painting something like this every now and then for as long as I paint nails. 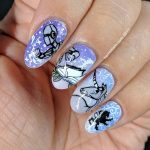 I’m also pleased they worked on short nails because it’s a reminder that I can still do awesome things even if my talons are shorter. Roald Dahl’s The Witches This was a tribute to second favorite Roald Dahl book, The Witches (my first being Fantastic Mr. Fox). I think I really just loved how sweet and loving the boy/mouse’s relationship with his grandmother was. 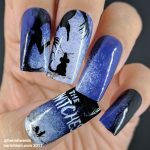 The witches, however, make a much cooler silhouette so they are the ones that were featured here. Cower, little mouse! After a lighter load for a month I came back with a vengeance and painted like mad. 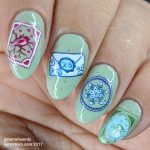 My nail art was all over the place topic-wise: from turkey-eating day to green giraffes. 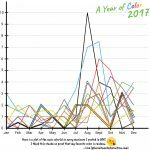 The rainbow was strong this month. Also, I really enjoyed all the Black Friday sales. Heh. 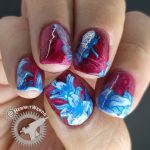 I think my favorite new indie brand (for me) was KBShimmer. Crellies, holos, cremes, they were all amazing. I’m going to be handing her my money for a long time to come, I think. This is also the first month I started coloring nail art in with Sharpie ink. Squirrel Park Picking favorites this month was hard, but I love this little squirrel design too much. I couldn’t even tell you if I thought this was in my best three design-wise because I’m emotionally too biased. It’s a cute little squirrel under a tree! And I just want to feed it and hug it too much. 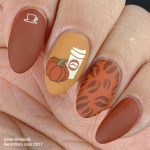 Pumpkin Spice Latte Orange is one of the colors I wear less often, but I am really into those de-saturated oranges that remind you of food. So this was the perfect mani for me and it really taught me that darker de-saturated oranges need a matte top coat if I’m wearing them. If only I’d really understood that on earlier designs. Owl Pajamas This was my first time using flocking ever and I haven’t used it since. 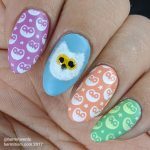 I actually have quite a collection of flocking in my craft hoard and I really want to do wear tests someday and also kiwi nails. I’m talking the fruit, but the bird would also be a lot of fun. Soon, I think. Meanwhile I love this design and I’m really happy I realized I needed to add more sparkle in the eyes because without it, the design would have looked weirdly flat, but with flocking. I will have to remember that the next time I use flocking. 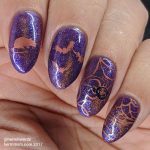 Thankfully Purple vs Thankfully Halloween This was a sad case of settling for something I really wasn’t happy with just so I could cross it off my schedule. Which, amusingly enough, does rather fit with what it’s like to craft with my stepdaughter. She only has so much attention span even when she wants to do something so she’ll eventually start dancing around and wiggling and you finally just have to stop because you’re not doing the activity you were doing with her anymore. Wish I had her energy. 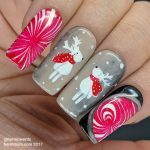 I’d also like to give an honorable mention to Polar Bears Sleigh because I like punny nail art . Christmas Cards I love the look of these mailing stamps and seals on my nails. It’s such a cute theme. 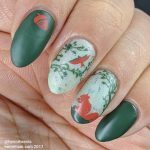 I would love to have a complete set of seasonal stamp nails, but I’m going to have to get real creative because I don’t know of any stamping plates with a bunch of stamp designs besides the one I used here. Vee shall see. 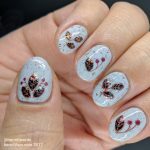 This whole blog post has been full of mentions of nail art I want to paint in the future. Rainbow City For once, I just took out my Sharpie markers and went to town with barely a plan. Fortunately I wasn’t supposed to be exactly replicating the inspiration image. Heh. I both drew directly on my nails with the marker and used rubbing alcohol and a paint brush with the ink. I think it ended up working really well, but since I like robot precision this isn’t something I expect I’ll do often. 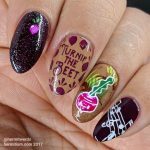 Un-beat-able vs We Beet Again This a classic doing the nail art for the principle of the thing which was using all my UberChic stamping plates once before the end of the year. And because I forced it, of course, it didn’t work out. I threw way too many elements in the design. Is this a pun and that’s why the music notes are there? Why is the turnip kawaii? Why would I ever combine those purples with those browns in that way? All questions I must answer when I recreate this one. 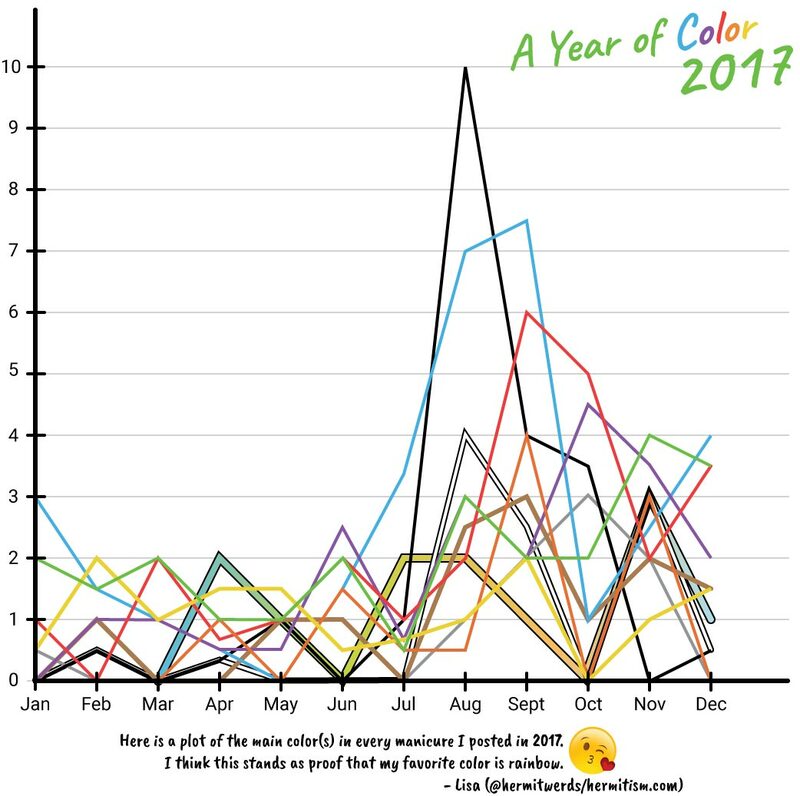 My most-used polish brand is Sinful Colors, which appeared in 65.5% (112/171) of my designs in 2017. It is my favorite mainstream brand because it’s so accessible and affordable. And a good ratio of the polishes have a great formulas too. It will likely always be my most-owned polish brand because it got a head start when I was poor and couldn’t afford indie polishes. And I’m certainly not going to buy a color I already have so they are there to stay. However, my most-used polish is a stamping polish: Mundo de Unas’ “White”. This also makes sense because I challenge myself to not use black to stamp all the time, but I never challenge myself that way about white. And even with that silent challenge happening in the background, I’ve only used white six more times than black. Heh. Finally, we get to stamping plates and naturally my most-used brand is Born Pretty, which appeared in 27.5% (47/171) of my designs in 2017. I own a lot of their stamping plates and–unlike Bundle Monster where I bought entire sets of circle plates–I individually picked each one as something I want to use. I’ve had to curb my purchasing of their plates lately because I still have so many I haven’t used yet. They’re just at a price point that’s so easy to buy! 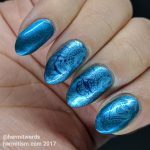 My most-used stamping plate is a tie between two plates at four uses each: Uber Chic’s The Far East-02 and Bundle Monster’s BM-XL135. Both favorites make a lot of sense. 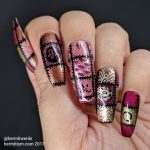 I love Far Eastern-themed nail art and I love Steampunk (therefore Victorian-era). I will be surprised if these two plates aren’t near the top in usage this year as well. I’ve already used the UberChic one once. The holiday sales were good to me. 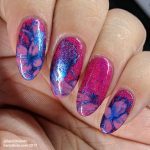 I tried a few new brands like Bee’s Knees Lacquer and KB Shimmer and loved them. But with new products comes the renewed goal of using them and I expanded it to more of the brands I own. 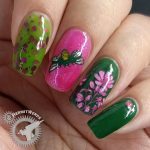 For the polishes, I still have Bee’s Knees Lacquer, Born Pretty, China Glaze, Dance Legend, Essie, Look, Masura, Ms Sparkle, ORLY, Pretty Serious, Sephora, Shinespark Polish, Turtle Tootsie, and Zoya. 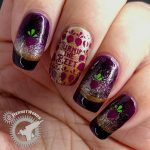 For the stamping plates I have Bundle Monster, CICI & SISI, Clear Jelly Stamper, KADs, Moyou London, and UR Sugar. Plus I do want to make a dent in my Born Pretty and misc Aliexpress purchases.